Apex Humidification Engineers is one of the few acclaimed names to offer axial flow fan through which the air flow parallel to the impeller axis. Our axial flow fan covers a wide range of quantities and pressure. Axial flow fans finds their utilization in a wide assortment of uses, extending from little cooling fans to the monster fans used in wind tunnels. It ranges from 600 mm dia to 1800 dia axial flow fans variable 4 blades to 8 blades. Impeller is made up of aluminium alloy along with aluminium blades. It is statically and dynamic balancing. Impeller is house in heavy duty casting made up of mild steel. Our Axial Flow Fans can be used industrial exhaust fresh air, generator aquatics. 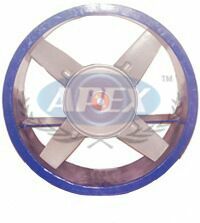 Axial Flow Fans are offered at reasonable prices at Apex. We offer axial flow fans designed to deliver large volumes of air at comparatively low pressure. Our range of axial flow fans includes: propeller type fans; tube axial fans. It is provided with adjustable blades to achieve high air volumes.